The main objective of this study was to explore demographics, wheelchair characteristics, and functional status indicators associated with changes in perceptions and functional performance of wheelchair users. Nineteen wheelchair users were selected for this exploratory study. Utilizing Exhaustive Chi-Squared Automatic Interaction Detector (CHAID) analysis, seven models were generated to examine specific demographics, wheelchair characteristics, and functional status indicators associated with pretest to posttest change scores in perceptions and performance of everyday tasks over time of three target variables. Validation of the models generated by Exhaustive CHAID analyses was conducted through the n-fold cross-validation procedure. The Functioning Everyday with a Wheelchair (FEW), the FEW-Capacity (FEW-C), and the FEW-Performance (FEW-P) were the measures used in this study. The means for the change score were larger for the FEW (1.08 ± 0.59) followed by the FEW-C (0.69 ± 0.63), and then the FEW-P (0.33 ± 0.45). Most of the factors identified in each model were derived from the pretest. Our study explored factors that were significantly associated with change scores of the FEW tools. Independence, number of physical assists, safety, and tasks related to Outdoor Mobility at pretest were the functional status indicators found to be of greatest importance and significantly associated with changes in perceptions and performance of everyday tasks over time in our models. For all analyses, the values of the Risk Estimate for the Risk Statistics and Cross-validation were close with relatively small differences, suggesting strong and reasonable confidence in the validity of the seven models. This study may suggest specific focus areas for assessment and intervention and may highlight the importance of some factors that influence changes in functional performance among clients who have been referred for, and prescribed, a wheeled mobility device. While performing the wheelchair evaluation process (functional assessment, wheelchair fitting and delivery, training, and follow-up), clinicians (i.e., occupational therapists, physical therapists) need to take various factors into consideration. These factors include (1) the client’s profile (medical and physical status, personality, attitude, temperament, and socio-cultural relations), (2) wheelchair characteristics (wheelchair design, brakes, frames, seat, seat functions, back height, footrests and armrests, positioning devices [i.e., cushions, seatbelts, lateral, head and back supports], propulsion techniques, etc. ), (3) the environment (physical and socio-cultural environments), and (4) the daily activities and social roles that the client performs . To ensure the accuracy of wheelchair prescription, all these factors need to be evaluated to help clinicians make the best possible fit between the client’s needs, goals, and social roles and the wheelchair selected [1,2]. A properly fitted and correctly prescribed wheelchair benefits both client and caregiver [3,4]. Clients use their wheelchairs more often if they receive them from an expert clinician who uses a multifactorial assessment-intervention process. Hoenig et al., described this process as a thorough evaluation that takes into account all the factors and is based on medical record review and self-reported and physical performance measures, individualization and modifications/adjustments of the wheelchair, home modifications as needed, client education, and follow-up . To aid in provision of the best quality wheelchairs and service delivery programs, Karmarkar et al., suggested that assessment of wheelchair fit is a continuous process requiring re-assessment of wheelchair fit as user’s age and their functional conditions change . Specific wheelchair characteristics (i.e., wheelchair type and design) are considered essential factors that can play a vital role in the wheelchair evaluation process. Differences in wheelchair type and design can lead to differences in a client’s performance of functional mobility skills. Choice of wheelchair may affect a client’s ability to be independent in a community setting. Research has shown that changes in the design of a wheelchair can result in positive changes in energy cost, joint kinematics and propulsion biomechanics . For example, the high degree of adjustability of the Ultra-light Wheelchairs (UWC), namely the ability to adjust the seat height in relation to axle position as well as place the axle forward of the center of gravity of the user, has been shown to increase the mobility of the user by decreasing rolling resistance, increasing propulsion efficiency and smoothness, and preserving upper extremity integrity . Cooper and his team also reported that the high degree of adjustability of the UWC can increase the mobility of the user and reduce the risk of secondary injury or disability [7,9,10]. Although these studies explored mobility characteristics and activity levels of wheelchair users, more research is needed to further assess the relationship between functional performance, wheelchair mobility, demographics, wheelchair characteristics, and indicators of function, namely, the critical assessment tasks associated with a clients’ abilities to carry out everyday tasks with their wheelchair. It is the dynamic interactions between these factors that pose the challenge for clinicians and wheelchair users as they decide on the best wheeled mobility interventions . Decision analysis methods, such as Exhaustive Chi-Squared Automatic Interaction Detector (CHAID) are analytic strategies that provide a mechanism for examining dynamic interactions among several variables, such as those just described . Decision analysis methods have been used in research such as assessment and intervention for Basic Activities of Daily Living (BADL) and Instrumental ADL (IADL) and to develop models to enhance stroke rehabilitation [13-15]. Despite the usefulness of decision analysis methods such as CHAID, few studies have applied these methods with wheelchair users. Allegretti utilized CHAID to conduct a secondary analysis of demographic and clinical data, from the Randomized Clinical Trial on Preventing Pressure Ulcers with Seat Cushions, to identify risk factors associated with acquiring/not acquiring a pressure ulcer in elderly long-term care residents, who were provided with custom fit wheelchairs and pressure-reducing cushions to prevent pressure ulcers . CHAID analyses confirmed known risk factors such as musculoskeletal/neurological/psychiatric illnesses, history of pressure ulcer, moisture, and independence in transfer, immobility, and identified new risk factors (e.g., Braden Activity/Mobility score, and type of wheelchair propulsion), that are associated with pressure ulcer development. Furthermore, Allegretti concluded that the CHAID decision-making tree could help rehabilitation clinicians identify and take into consideration the different pressure ulcer risk factors when assessing new clients for wheeled mobility devices. The specific aim of this study was to examine demographics, wheelchair characteristics, and functional status indicators associated with pretest to posttest change scores of three target variables. These target variables were the mean pretest to posttest change scores for (1) the self-report Functioning Everyday with a Wheelchair Beta Version 2.0 (FEW) tool, (2) the performance-based Functioning Everyday with a Wheelchair - Capacity (FEW-C) tool, and (3) the performance-based Functioning Everyday with a Wheelchair - Performance (FEW-P) tool. By identifying the demographics, wheelchair characteristics, and functional status indicators significantly associated with changes in wheelchair function from pretest to posttest, we hope to identify the factors clinicians (i.e., occupational therapists) must address during the pretest assessment. Likewise, the factors are most strongly associated with (predict) changes in wheelchair function can provide guidance to clinicians about where to focus potential interventions to bring about change. This was a secondary analysis of data collected in two previous studies [17,18]. The primary goals of these studies were to develop the FEW, the FEW-P, and the FEW-C [17,18]. The same participants were tested in both studies. Mills reported on the FEW and FEW-P, and Schmeler the FEW and FEW-C. Our current regression study explored the association between the change scores (Posttest minus Pretest) of the FEW, FEW-C, and FEW-P (target variables) and demographics, wheelchair characteristics, and functional status indicators (predictor variables), utilizing Exhaustive CHAID. Seven models were generated; one for the FEW, three for the FEW-C (Independence, Safety, and Quality), and three for the FEW-P (Independence, Safety, and Quality). This study is exploratory, with no hypothesis. Participants for the current study were a subset of participants from the studies by Mills and Schmeler [17,18]. Participants in studies by Mills and Schmeler were recruited from the University of Pittsburgh Medical Center, Center for Assistive Technology (CAT) in Pittsburgh, Pennsylvania, the Hiram G. Andrews Center (HGAC), and the Center for Assistive and Rehabilitative Technology (CART) in Johnstown, Pennsylvania [17,18]. All participants were seen at the three sites for provision of a wheeled mobility and seating device. The inclusion criteria for participants recruited for these studies were (a) existing manual/power wheelchair or scooter user, who had experienced a change in functional status; (b) 18 years of age or older; and (c) adequate cognitive and language status, that is participants would be able to understand and verbally respond to questions and carry out the tasks in the FEW, FEW-C and FEW-P. Cognition and language status were determined by information provided by team members from the Center for Assistive Technology (CAT) and the Center for Assistive and Rehabilitative Technology (CART). Although informed consent was obtained from 25 participants, only 19 participants had complete data for all three instruments, and therefore the secondary analyses were conducted with data from those 19 participants. Our study sample consisted of 19 wheelchair users with progressive or non-progressive conditions who needed a new wheeled mobility and seating device. Nine were male and 10 were female. The average participant was Caucasian, 53.1 (± 11.0) years old, and had used a wheelchair for 9.5 (± 11.3) years. Participants with multiple sclerosis comprised over one third of the sample (Table 1). At pretest, 16 of the wheelchairs were manual and 3 were power. The manual wheelchairs, on average, were 3.7 (± 2.5) years old and most of them had no seat functions. At posttest, all participants had power wheelchairs, and most of these wheelchairs were equipped with multiple seat functions (Table 2). Prior to the start of each study, University of Pittsburgh Institutional Review Board (IRB) approval was obtained and once potential participants were recruited, study procedures were explained and written informed consents were obtained from those willing to participate. Participants were assessed with their current wheelchairs at pretest, and later at posttest when they received their new wheelchairs. The FEW was administered first followed by the FEW-C and the FEW-P (Figure 1). Mean duration between pretest and posttest for the three tools was 57 days (SD ± 46) with a median of 44 days and a range from 9 to 189 days. Time between pretest and posttest assessments varied based on insurance funding, transportation resources to the clinic, and the duration the participants had to wait to get their new wheelchairs. Participants had to have their new mobility device a minimum of 2 weeks before the posttest. The FEW and FEW-C pretest assessments occurred on a regularly scheduled clinic visit for a seating evaluation, followed by the FEW-P (home) assessment within 1 week. The posttest assessments occurred in the same sequence (FEW, FEW-C, FEW-P) after receiving the new wheelchair [17,18]. A fixed rather than a random order of assessment methods was followed, with self-report before performance because perceptions (self-reports) are more likely to be biased by performance than the reverse. The FEW, FEW-C, and FEW-P were the measures used in this study. The FEW is a self-report tool consisting of 10 questions about how independently clients carry out everyday tasks with their wheelchairs. The FEW-C is a performance based tool consisting of 1 self-report item and 9 performance items that match the items on the FEW, and are scored for three categories of performance: independence, safety and quality. It is meant to be used in a clinic. The FEW-P is also a performance based tool consisting of 1 self-report item and 9 performance items that match the items on the FEW, and like the FEW-C, is scored for three categories of performance. It is meant to be administered in the home. Each of the tools is valid and reliable. The current study is delimited to items 2 - 10 of each tool because these are the performance items on the FEW-C and FEW-P. The FEW Beta version 2.0 is a 10 item structured self-report outcome measurement tool (Table 3) that was developed based on input and validation from wheelchair users. The FEW can be self-administered, administered as an interview or administered by telephone. Items 2-10 of the FEW measure perceived functional independence of individuals who use a wheelchair or scooter as their primary mobility and seating device and have progressive or non-progressive conditions. For example, the operate item is “The size, fit, postural support and functional features of my wheelchair/scooter allow me to operate it as independently… as possible: (e.g., do what I want it to do when and where I want to do it). The items are scored using a 6 point scale of 6 = completely agree to 1 = completely disagree, and a score of 0 = does not apply. The FEW enables clients to identify the degree of problems they have performing 9 functional tasks in their daily lives while using their wheelchairs (manual/power wheelchair/scooter). It has excellent test-retest reliability (ICC = 0.92). In addition, the FEW has excellent content validity because it was generated by input from both consumers and clinicians, validated by several samples of wheelchair/scooter users, and shown to be capable of detecting users’ perceived function with a wheelchair over time [17,19,20]. The FEW-C is a performance-based observation tool, for use by clinicians and researchers to measure functional outcomes of wheelchair and seating interventions in the clinical setting. Items 2 - 10 were structured using the criterion-referenced approach of the performance assessment of Self-Care Skills (PASS) and designed to match the items of the FEW [21,22]. The FEW-C was designed to measure function based on the International Classification of Functioning, Disability and Health (ICF) construct of capacity, namely, a person’s ability to execute a task under standardized conditions . The FEW-C has demonstrated excellent interrater reliability (ICC = 0.99), excellent internal consistency (α = 0.97), and fair to good convergent validity when compared with tools measuring similar traits (e.g., the FEW, and the Functional Abilities in a Wheelchair (FAW) tools) by different methods . The FEW-P is a performance-based observation tool, for use by clinicians and researchers to measure functional outcomes of seating and wheeled mobility interventions in the home/community. Items 2 - 10 are performance-based, as in the FEW-C. The FEW-P was designed to measure function based on the ICF construct of performance in the “lived in” environment . The FEW-P has demonstrated excellent inter-rater reliability and internal consistency (α = 0.95) . Summary scores are based on a predefined 4-point ordinal scale for independence and scores are hierarchical, ranging from 3 (no assists given for task initiation, continuation, completion) to 0 (three physical assists or total assistance given for task initiation, continuation, or completion) (Table 4) [17,18]. For each item, the assessor observes the wheelchair user perform the task and rates the level of independence based on the type and number of assists given. The manual provides detailed information on the administration, scoring, and interpretation for each item . Descriptive statistics for change scores (mean, standard deviation, range, and confidence interval for the mean) for the FEW, FEW-C, and FEW-P were calculated to prepare for the Exhaustive CHAID analysis. Exhaustive CHAID analysis was used to develop seven models (one for the FEW, three for the FEW-C; Independence, Safety, and Quality, and three for the FEW-P; Independence, Safety, and Quality) to identify specific demographics, wheelchair characteristics, and functional status indicators associated with more or less favorable outcomes among the three outcome measures. Exhaustive CHAID Analysis is used to determine associations between multiple independent predictor variables (categorical or continuous) and a single target outcome measure. One of the advantages of Exhaustive CHAID analysis is that it works for all types of variables and can generate a decision tree of the relationships between the target (dependent) variable and the related factors. The root is the target outcome and describes the target variable. The decision tree branches identify the demographics, wheelchair characteristics, and functional status indicators that are most strongly associated with the target variable and divide the tree into the most favorable functional outcomes on the left and the least favorable functional outcomes on the right. Exhaustive CHAID evaluates all the values of the potential predictor variables using the significance of a statistical test as a criterion for entering the model. The statistical test used depends on the measurement level of the target variable, and because all target variables in this study were continuous, an F test was used . Exhaustive CHAID was used in this study because it is exploratory, and its thorough iterative process enhances the possibility of finding more variables (demographics, wheelchair characteristics, and functional status indicators) associated with more and less favorable outcomes of the target outcome (change scores for the FEW, FEW-C, and FEW-P). The strength of Exhaustive CHAID analysis is that it reduces researcher bias in identifying the final predictor variables and the cutoff scores of the predictor variables . Given the small sample size in this study, validation of the models generated by Exhaustive CHAID analyses was conducted through the n-fold cross-validation procedure. The n-fold method is an established cross-validation method and is ideal for use with small sample sizes. The n-fold procedure involves random division of the sample into smaller subsamples from which the model is regenerated. The output of the cross-validation procedure is a table displaying the Risk Estimate and the Standard Deviation (SD) of the Risk Estimate for the Risk Statistics and Cross-validation. The closer the values of the Risk Estimate for the Risk Statistics and Cross-validation, the stronger the predictive value of the model . To explain our findings, paired t-tests were used to examine differences between pretest and posttest perceptions of participants’ health status on an average day over the last three months and on the day of testing. We defined statistical significance as p < .05. Spearman’s rho correlation coefficients were then used to examine relationships between change in participants’ average health status over the past three months and day of testing and change in participants’ function on the FEW, FEW-C, and FEW-P. We defined statistical significance as p < .05 and with the Bonferroni adjustment statistical significance was p < .01 . The target variables for the seven models were the mean pretest to posttest change scores for the FEW, the three FEW-C category scores (Independence, Safety, and Quality), and the three FEW-P category scores (Independence, Safety, and Quality). The predictor variables of the pretest to posttest change scores for the FEW included demographic variables of participants, specific characteristics of wheelchairs, and functional status as indicated in the data derived from items 2-10 of the FEW pretest and FEW posttest. The predictor variables of the pretest to posttest change scores for the FEW-C included demographic variables of participants, specific characteristics of wheelchairs, and functional status as indicated in the data derived from items 2-10 of the FEW pretest and FEW posttest, and the FEW-C pretest and FEW-C posttest. The predictor variables of the pretest to posttest change scores for the FEW-P included demographic variables of participants, specific characteristics of wheelchairs, and functional status as indicated in the data derived from items 2-10 of the FEW pretest and FEW posttest, the FEW-C pretest and FEW-C posttest, and the FEW-P pretest and FEW-P posttest. Demographics included age, gender, race, and years using a wheelchair, age of current wheelchair, number of wheelchairs owned, and primary medical condition. Wheelchair characteristics included manufacturer and model, type of wheelchair, weight of wheelchair, power chair drive type, back supports, foot supports, arm supports, seatbelt, and power seat functions. Functional status indicators consisted of the FEW independence scores for items 2-10, and the independence, safety and quality scores for items 2 - 10 of the FEW-C and FEW-P.
Descriptive statistics of change scores for the FEW, FEW-C, and FEW-P are presented in table 5. As shown in the table, the means for the change score were larger for the FEW followed by the FEW-C and then the FEW-P. This trend indicates that at pretest, in general, the scores were worse for the FEW when compared with the FEW-C and FEW-P. Also, this indicates that most participants improved (scored higher) at posttest. 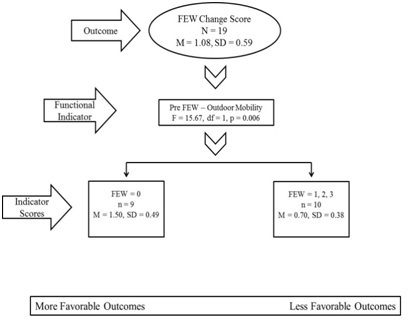 In the Exhaustive CHAID model (Figure 2), for the FEW change score target variable, the Outdoor Mobility task for the FEW at pretest was the functional indicator most strongly associated with the FEW change score outcome (F = 15.67, p = 0.006), separating the sample into two significantly different subsamples; participants who completely disagreed that the size, fit, postural support and functional features of their wheelchair allowed them to get around outdoors as independently, safely, and efficiently as possible (n = 9), and participants whose responses ranged from mostly disagreed to completely agreed that the size, fit, postural support and functional features of their wheelchair allowed them to get around outdoors as independently, safely, and efficiently as possible (n = 10). Table 6 outlines the results obtained from the n-fold cross validation procedure for the FEW change score model. As displayed in the table, the difference between the Risk Estimate for the Risk Statistics and Cross-validation was 0.01 suggesting reasonable confidence in the validity of the model. For the FEW-C Independence change score model (Figure 3), the Operate task of the FEW-C at pretest, more specifically the number of physical assists needed to turn the wheelchair, was the functional indicator most strongly associated with FEW-C change score outcome (F = 17.88, p = .0006), separating the sample into two significantly different subsamples: participants who needed one, two, or three physical assists to turn their wheelchairs (n = 6) and participants who turned their wheelchair with no physical assists (n = 13). For participants who were able to turn their wheelchair with no physical assists, the next strongest functional indicator was the Transfer task for the FEW-C at pretest, more specifically the number of physical assists required to transfer back from a surface with the same height as the wheelchair (Easy Transfer) (F = 17.01, p = .005). Exhaustive CHAID divided this subsample into two significantly different subsamples: participants who needed one, two, or three physical assists to transfer (n = 6) and participants who transferred with no physical assists (n = 7). Table 7 outlines the results obtained from the n-fold cross validation procedure for the FEW-C Independence change score model. As displayed in the table, the difference between the Risk Estimate for the Risk Statistics and Cross-validation was 0.12 suggesting reasonable confidence in the validity of the model. 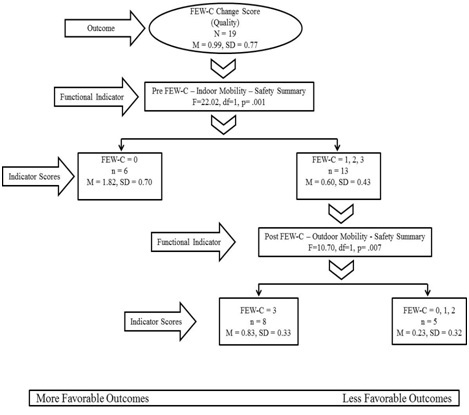 For the FEW-C Safety change score model (Figure 4), the ability to perform the FEW-C Indoor Mobility task safely at pretest (the safety summary score), was the functional indicator most strongly associated with the FEW-C Safety change score outcome (F = 24.93, p = .0007), separating the sample into two significantly different subsamples: participants who were at severe risk (n = 6) and participants who had a potential risk, minor risk, or demonstrated safe practices (n = 13). For participants who had a potential risk, minor risk, or had safe practices the next strongest functional indicator was the Personal Care task of the FEW-C at pretest, more specifically the quality summary score (F = 10.36, p = .02). Exhaustive CHAID again divided the subsample into two significantly different subsamples: participants whose Personal Care quality score was acceptable with standards met (n = 6), and participants whose Personal Care quality scores were unacceptable with standards not met, standards partially met, or standards acceptable with improvement possible (n = 7). Table 8 outlines the results obtained from the n-fold cross validation procedure for the FEW-C Safety change score model. As displayed in the table, the difference between the Risk Estimate for the Risk Statistics and Cross-validation was 0.06 suggesting reasonable confidence in the validity of the model. 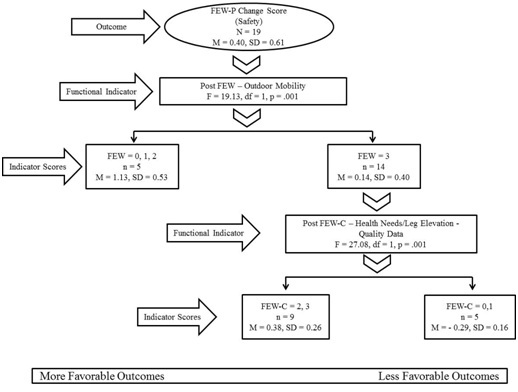 For the FEW-C Quality change score model (Figure 5), the ability to perform the FEW-C Indoor Mobility task safely at pretest (i.e., safety summary score), was the functional indicator most strongly associated with the FEW-C Quality change score outcome (F = 22.02, p = .001), separating the sample into two significantly different subsamples: participants who were at severe risk (n = 6) and participants who had a potential risk, minor risk, or demonstrated safe practices (n = 13). For participants who had a potential risk, minor risk, or demonstrated safe practices the next strongest functional indicator was the ability to perform the FEW-C Outdoor Mobility task safely (i.e., safety summary score) at posttest (F = 10.70, p = .007). Exhaustive CHAID again divided the subsample into two significantly different subsamples: participants who demonstrated safe practices (n = 8) and participants who had severe risk, minor risk, or a potential risk (n = 5). Table 9 outlines the results obtained from the n-fold cross validation procedure for the FEW-C Quality change score model. As displayed in the table, the difference between the Risk Estimate for the Risk Statistics and Cross-validation was 0.05 suggesting reasonable confidence in the validity of the model. For the FEW-P Independence change score model (Figure 6), the ability to independently perform the Personal Care task of the FEW-P at pretest, more specifically the independence summary score of upper body dressing sub-task (the ability to take off shirt/coat/jacket independently while seated in a wheelchair), was the functional indicator most strongly associated with the FEW-P Independence change scores outcome (F = 23.07, p = .001). Exhaustive CHAID separated the sample into two significantly different subsamples: participants who needed either total assistance, continuous verbal and/or visual assists or occasional physical assists, or occasional verbal and/or visual assists (n = 5) and participants who were able to take off a shirt/coat/jacket while seated in a wheelchair with no assists (n = 14). For participants who were able to take off a shirt/coat/jacket while seated in a wheelchair with no assists the next strongest functional indicator was the ability to safely perform the FEW-P Outdoor Mobility task at pretest, more specifically the ability to travel safely on flat easy terrain (F = 24.91, p = .0009). Exhaustive CHAID divided the subsample into two significantly different subsamples: participants who had severe risks, minor risks, or a potential risk (n = 7) and participants who demonstrated safe practices (n = 7). Table 10 outlines the results obtained from the n-fold cross validation procedure for the FEW-P Independence change score model. As displayed in the table, the difference between the Risk Estimate for the Risk Statistics and Cross-validation was 0.02 suggesting reasonable confidence in the validity of the model. 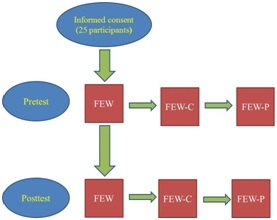 For the FEW-P Safety change score model (Figure 7), the FEW Outdoor Mobility task at posttest was the functional indicator most strongly associated with FEW-P Safety change score outcome (F = 19.13, p = .001), separating the sample into two significantly different subsamples: participants who completely disagreed to mostly agreed that the size, fit, postural support and functional features of their wheelchair allowed them to get around outdoors as independently, safely, and efficiently as possible (n = 5) and participants who completely agreed that the size, fit, postural support and functional features of their wheelchair allowed them to get around outdoors as independently as possible (n = 14). For participants who completely agreed that their wheelchair allowed them to get around outdoors as independently as possible, the next strongest functional indicator was the FEW-C Health Needs task Quality score at posttest, more specifically the ability to adequately and efficiently elevate legs while seated in a wheelchair (F = 27.08, p = .001). Exhaustive CHAID again divided the subsample into two significantly different subsamples. Participants whose quality of performance was acceptable with improvement possible or acceptable with standards met (n = 9) and participants whose quality of performance was unacceptable with standards not met or with standards partially met (n = 5). Table 11 outlines the results obtained from the n-fold cross validation procedure for the FEW-P Safety change score model. As displayed in the table, the largest difference between the Risk Estimate for the Risk Statistics and Cross-validation was 0.03 suggesting reasonable confidence in the validity of the model. 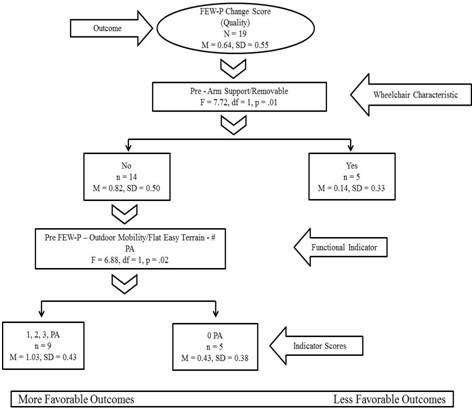 For the FEW-P Quality change score model (Figure 8), the presence of an arm support at pretest, more specifically the removable arm support, was the wheelchair characteristic variable most strongly associated with the FEW-P Quality change score outcome (F = 7.72, p = .01), separating the sample into two significantly different subsamples: participants whose wheelchairs did not have a removable arm support at pretest (n = 14) and participants whose wheelchair had a removable arm support at pretest (n = 5). For participants whose wheelchair did not have a removable arm support at pretest the next strongest functional indicator was independence performing the FEW-P Outdoor Mobility task at pretest, more specifically the number of physical assists needed to travel on flat easy terrain (F = 6.88, p = .02). Exhaustive CHAID again divided the subsample into two significantly different subsamples: participants who needed one, two, or three physical assists to travel on flat easy terrain (n = 9) and participants who traveled on flat easy terrain with no physical assists (n = 5). Table 12 outlines the results obtained from the n-fold cross validation procedure for the FEW-P Quality change score model. As displayed in the table, the largest difference between the Risk Estimate for the Risk Statistics and Cross-validation was 0.10 suggesting reasonable confidence in the validity of the model. Table 13 summarizes the results from the seven Exhaustive CHAID models. Pre-post change variables, significant predictors, and more or less favorable outcomes are identified. The results of paired t-tests indicated that there were significant differences between pretest and posttest in both participants’ perceived health status on an average day over the last three months and participants’ perceived health status on the day of testing (Table 14). There were no significant differences between participants’ perceived health today and average health at either pretest or posttest (data not shown). The results of Spearman’s rho correlation coefficients indicated that there were no significant relationships between change in participants’ health status on an average day over the last three months and day of testing and change in participants’ function on the FEW, FEW-C (Independence, Safety, Quality), and FEW-P (Independence, Safety, Quality). This study is unique because it is the first to apply Exhaustive CHAID methods to examine the dynamic associations among demographics, wheelchair characteristics, and functional status indicators, and change scores of the FEW, FEW-C, and FEW-P tools that measure “functioning every day with a wheelchair”. At first glance we note that, most of the factors identified in each model were derived from the pretest indicating that it was the pretest status that was driving the change. Also, in all models, worse scores at pretest on the FEW, FEW-C, and FEW-P were associated with larger change scores and thus more favorable outcomes, except in three instances, where better scores at pretest in the FEW-C Safety and Quality models and at posttest in the FEW-P Safety model were associated with greater change. Additionally, in all models, when applicable, the greater the number of physical assists needed at pretest, the larger the change score. Clinically, the poorer the wheelchair fit and performance at pretest, the greater the changes in fit and performance at posttest because the participants’ new power chairs were prescribed and custom fit by qualified wheeled mobility and seating professionals. Another interesting finding was that Outdoor Mobility was a significant predictor in five models which highlights the importance of this specific item and related tasks/skills (i.e., the ability to travel safely on flat easy terrain) in changes in functional performance of wheelchair users. This finding confirms the work of previous studies which highlighted the role of outdoor mobility and its related tasks/skills and reported that involvement in outdoor activities such as being active in the community help wheelchair users maintain wheelchair skills and are positively associated with their functional performance . Our data also showed that the amount of change was larger for the FEW when compared to the FEW-C and FEW-P and it were the pretest scores that were driving the change. An explanation for that could be because the participants in Mills and Schmeler studies had come to a clinical setting to be evaluated for a new wheeled mobility and seating device, their perceptions of their function as indicated on the FEW may have been worse than their actual performance as indicated on the FEW-C and FEW-P [17,18]. These participants tended to underestimate their capabilities on the FEW self-report tools compared to their pretest performance, which is not unusual for individuals who are seeking interventions to obtain health services or a new product and/or equipment [18,27]. Furthermore, although participants’ perceived health status improved significantly at posttest, the results of Spearman’s rho correlation coefficients indicated that there were no significant relationships between change in participants’ perceived health status and change in participants’ function. This suggests that improvement in participants’ performance at posttest was not associated with their improved health status, but rather due to the effect of the new properly fitted wheelchairs provided by a qualified interdisciplinary team of clinicians. For Independence predictor variables, worse independence scores and more physical assists needed to perform different tasks at pretest (Outdoor Mobility, Operate, Transfer, Personal Care) and posttest (Outdoor Mobility) were associated with larger change scores (more favorable outcomes) and that was consistent among the three models for the FEW, FEW-C, and FEW-P. For Safety predictor variables, worse safety scores while performing different tasks (Indoor Mobility, Outdoor Mobility) at pretest were associated with larger change scores (more favorable outcomes) and that was consistent among the two models for the FEW-C, and FEW-P. However, worse safety scores while performing the Outdoor Mobility task at posttest was associated with smaller change scores (less favorable outcomes) as indicated in the FEW-C Quality change score model. For Quality predictor variables, at both pretest and posttest, better quality scores were always associated with larger change scores (more favorable outcomes) as indicated in both the FEW-C Safety change score model --- Personal Care quality summary, and the FEW-P Safety change score model ---Health Needs/Leg Elevation quality data. The utility of Exhaustive CHAID methods was evaluated by examining the validity of the factors identified in each analysis through the n-fold cross-validation procedure. Examining the factors identified in each analysis provides some support for the validity of the methods. For all analyses, the values of the Risk Estimate for the Risk Statistics and Cross-validation were fairly close with relatively small differences, providing strong and reasonable confidence in the validity of these models. With Exhaustive CHAID, even though it is an iterative process, variables that had missing data such as the Transportation task did not enter any of the models. Also, even though no data were missing, surprisingly, no demographics were indicated and only one wheelchair characteristic was included in the Exhaustive CHAID analyses, namely, whether the participants had a removable arm support at pretest. This finding is not consistent with the current body of literature which reports that demographic variables such as age, race, employment status, and type of wheelchair can contribute to different functional performance outcomes [7-11,28]. This finding warrants further investigation to examine the dynamic interaction between the various demographics and wheelchair characteristics and change scores of the FEW, FEW-C, and FEW-P tools that measure functional performance of wheelchair users. Clinically, the most prominent finding from our models suggests that independence, number of physical assists, safety, and tasks related to Outdoor Mobility at pretest are functional indicators of great importance for change in perceptions and performance in everyday tasks of wheelchair users. Therefore, if clinicians (i.e., occupational therapists) thoroughly assess these indicators which then can be targeted for intervention, perceptions and performance of wheelchair users may be developed and lead to improved everyday functioning. Another relevant clinical finding is that worse independence and safety scores and a greater number of physical assists needed to perform different tasks at pretest were associated with larger change scores (more favorable outcomes) which is considered a potential area for intervention that clinicians need to focus on when prescribing a new wheelchair. There were several limitations to the present study. When examining associations among the various factors and their influence on change scores for the FEW, FEW-C, and FEW-P, Exhaustive CHAID methods offer distinct advantages over traditional linear methods (e.g. multiple regressions). These advantages are the ability of Exhaustive CHAID methods to identify which factors most strongly associate with the outcomes, and identify favorable and unfavorable outcomes without researcher bias. However, our small sample may limit the generalizability of our findings, even though our cross-validation data confirmed the validity of our models. Moreover, the generalizability of our findings may be limited due to our inclusion of a homogeneous sample of experienced manual wheelchair users that did not demonstrate cognitive or language impairments. Our sample was also limited in terms of the diversity of diagnoses of the participants. In 2002, the Disability Statistics Center reported that osteoarthritis, stroke, multiple sclerosis, absence or loss of lower extremity as the most prevalent primary conditions causing disability among wheelchair users . Furthermore, each year an estimated 12,000 people in the United States sustain Spinal Cord Injuries (SCI) with prevalence rate of approximately 259,000 in any given year . Many persons with SCI use a wheelchair for mobility in daily life and may completely depend on a wheelchair for their mobility . Our study was conducted in 2013 and analyzed data from previous studies [17,18]. The inclusion of wheelchair users stratified to represent more recent dataset of primary wheelchair user groups in future studies would strengthen the generalizability of our findings. The findings of this study shed light on factors (functional status indicators, and one wheelchair characteristic) that were significantly associated with change scores of the FEW, FEW-C, and FEW-P tools that measure daily activities with a wheelchair. Independence, number of physical assists, safety, and tasks related to Outdoor Mobility at pretest were the functional status indicators found to be of greatest importance and significantly associated with changes in perceptions and performance of everyday tasks over time in our models. Whether the participants had a removable arm support at pretest was the only wheelchair characteristic that proved to be significant in our models. Examining these factors closely in a clinical setting in wheelchair users during the seating evaluation and intervention process is necessary and may better enhance understanding of the effect of such indicators on wheelchair users’ perceptions and functional performance. Decision analysis methods are helpful and may be used to examine the dynamic interaction among various client demographics, wheelchair characteristics, and functional status indicators of everyday task performance with a wheelchair. Simple decision trees can be generated which may identify priorities for further clinical inquiry in wheeled mobility and seating interventions. These methods may suggest specific focus areas for assessment and intervention for clinicians (i.e., occupational therapists) and may highlight the importance of some factors that influence changes in functional performance among clients who have been referred for, and prescribed, a wheeled mobility device. We hope that the results of this study will improve the clinical practice for future wheeled mobility and seating interventions and have a positive significant impact on wheelchair users, practitioners and suppliers. Routhier F, Vincent C, Desrosiers J, Nadeau S (2003) Mobility of wheelchair users: A proposed performance assessment framework. Disabil Rehabil 25: 19-34. Rogers JC, Holm MB (1991) Task performance of older adults and low assistive technology devices. International Journal of Technology and Aging 4: 93-106. Brienza D, Kelsey S, Karg P, Allegretti A, Olson M, et al. (2010) A randomized clinical trial on preventing pressure ulcers with wheelchair seat cushions. J Am Geriatr Soc 58: 2308-2314. Smith C, McCreadie M, Unsworth J (1995). Prescribing wheelchairs: The opinions of wheelchair users and their carers. Clinical Rehabilitation 9: 74-80. Hoenig H, Landerman LR, Shipp KM, Pieper C, Pieper C, et al. (2005) A clinical trial of a rehabilitation expert clinician versus usual care for providing manual wheelchairs. J Am Geriatr Soc 53: 1712-1720. Karmarkar AM, Collins DM, Kelleher A, Cooper RA (2009) Satisfaction related to wheelchair use in older adults in both nursing homes and community dwelling. Disabil Rehabil Assist Technol 4: 337-343.
Cooper RA, Boninger ML, Rentschler A (1999) Evaluation of selected ultralight manual wheelchairs using ANSI/RESNA standards. Arch Phys Med Rehabil 80: 462-467. Rogers H, Berman S, Fails D, Jaser J (2003) A comparison of functional mobility in standard vs. ultralight wheelchairs as measured by performance on a community obstacle course. Disabil Rehabil 25: 1083-1088.
Cooper RA, Gonzalez J, Lawrence B, Renschler A, Boninger ML, et al. (1997) Performance of selected lightweight wheelchairs on ANSI/RESNA tests. American National Standards Institute-Rehabilitation Engineering and Assistive Technology Society of North America. Arch Phys Med Rehabil 78: 1138-1144.
Cooper RA, Robertson RN, Lawrence B, Heil T, Albright SJ, et al. (1996) Life-cycle analysis of depot versus rehabilitation manual wheelchairs. J Rehabil Res Dev 33: 45-55. Oyster ML, Karmarkar AM, Patrick M, Read MS, Nicolini L, et al. (2011) Investigation of factors associated with manual wheelchair mobility in persons with spinal cord injury. Arch Phys Med Rehabil 92: 484-490. SPSS Incorporated (2001) Answer Tree 3.0 User's Guide. SPSS Incorporated, Chicago, USA. Pg no: 266. Huang YH, Wu CY, Lin KC, Hsieh YW, Snow WM, et al. (2013) Determinants of change in stroke-specific quality of life after distributed constraint-induced therapy. Am J Occup Ther 67: 54-63. Skidmore ER, Rogers JC, Chandler LS, Holm MB (2006) Developing empirical models to enhance stroke rehabilitation. Disabil Rehabil 28: 1027-1034. Skidmore ER, Rogers JC, Chandler LS, Holm MB (2006). Dynamic interactions between impairment and activity after stroke: Examining the utility of decision analysis methods. Clin Rehabil 20: 523-535. Allegretti ALC (2008) Factors associated with clinical decisions and pressure ulcer development in long term care residents. Doctoral Dissertation, University of Pittsburgh, Pennsylvania, USA. Mills TL (2003) Functioning Everyday with a Wheelchair (FEW): Development and Validation of Self-report and Performance-based Observation Instruments to Measure Functional Outcomes of Seating-mobility Interventions. University of Pittsburgh, Pennsylvania, USA. Pg no: 556. Schmeler M (2005) Development and Testing of a Clinical Outcome Measurement Tool to Assess Wheeled Mobility and Seating Interventions. Doctoral Dissertation, University of Pittsburgh, Pennsylvania, USA. Mills TL, Holm MB, Schmeler M (2007) Test-retest reliability and cross validation of the Functioning Everyday with a Wheelchair instrument. Assist Technol 19: 61-77. Mills T, Holm MB, Trefler E, Schmeler M, Fitzgerald S, et al. (2002) Development and consumer validation of the Functional Evaluation in a Wheelchair (FEW) instrument. Disabil Rehabil 24: 38-46. Holm MB, Rogers JC (1999) Functional assessment: The Performance Assessment of Self Care Skills (PASS). In: Hemphill-Pearson BJ (ed.). Assessment in Occupational Therapy Mental Health: An Integrative Approach. Slack, Thorofare, USA. Pg no: 431. Rogers JC, Holm MB (2014) Performance Assessment of Self-care Skills (PASS). University of Pittsburgh, Pennsylvania, USA. World Health Organization (2001) International Classification of Functioning, Disability and Health (ICF). WHO, Geneva, Switzerland. Field A (2009) Discovering Statistics Using SPSS. SAGE Publications, California, USA. Pg no: 821. Kass GV (1980) An exploratory technique for investigating large quantities of categorical data. Applied Statistics 29: 119-127. Kilkens OJ, Post MW, Dallmeijer AJ, van Asbeck FW, van der Woude LH (2005) Relationship between manual wheelchair skill performance and participation of persons with spinal cord injuries 1 year after discharge from inpatient rehabilitation. J Rehabil Res Dev 42: 65-74. Cress ME, Schechtman KB, Mulrow CD, Fiatarone MA, Gerety MB, et al. (1995) Relationship between physical performance and self-perceived physical function. J Am Geriatr Soc 43: 93-101.
Cooper RA, Thorman T, Cooper R, Dvorznak MJ, Fitzgerald SG, et al. (2002) Driving characteristics of electric-powered wheelchair users: How far, fast, and often do people drive? Arch Phys Med Rehabil 83: 250-255. Kaye HS, Kang T, LaPlante MP (2002) Wheelchair Use in the United States. Pantsupeasy, Pleasanton, USA. National Spinal Cord Injury Statistical Center (2009) Spinal Cord Injury Statistics. NSCISC, Birmingham, Alabama. Figure 1: Flow diagram of the FEW, FEW-C, and FEW-P data collection. Figure 2: Exhaustive CHAID analysis of the FEW change score: Functional indicators associated with more and less favorable outcomes. N.B. Pre = Pretest; FEW: the Functioning Everyday with a Wheelchair tool (the self-report version); (FEW: 0 = completely disagree; 3 = completely agree). Figure 3: Exhaustive CHAID analysis of the FEW-C change score (Independence): Functional indicators associated with more and less favorable outcomes. N.B. Pre = Pretest; FEW-C: the Functioning Everyday with a Wheelchair tool - FEW-Capacity (the clinic-version); # PA = Number of physical assists; Easy 2 = transfer back from identified surface to wheelchair (same height). Figure 4: Exhaustive CHAID analysis of the FEW-C change score (Safety): Functional indicators associated with more and less favorable outcomes. N.B. Pre = Pretest; FEW-C: the Functioning Everyday with a Wheelchair tool - FEW-Capacity (the clinic-version); (safety summary: 0 = severe risks; 3 = safe practices); (quality summary: 0 = unacceptable (standards not met; 3 = acceptable (standards met). N.B. Pre = Pretest; Post = Posttest; FEW-C: the Functioning Everyday with a Wheelchair tool – FEW-Capacity (the clinic-version); (safety summary: 0 = severe risks; 3 = safe practices). 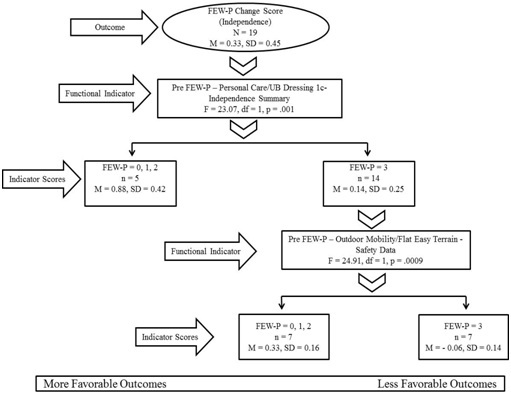 Figure 6: Exhaustive CHAID analysis of the FEW-P change score (Independence): Functional indicators associated with more and less favorable outcomes. N.B. Pre = Pretest; FEW-P: the Functioning Everyday with a Wheelchair tool - FEW-Performance (the home-version); UB Dressing 1c: upper body dressing (takes off shirt/coat/jacket while seated in a wheelchair); (independence summary: 0 = total assistance; 3 = no assists); (safety data: 0 = severe risks; 3 = safe practices). 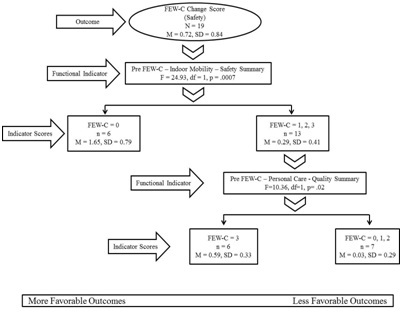 Figure 7: Exhaustive CHAID analysis of the FEW-P change score (Safety): Functional indicators associated with more and less favorable outcomes. N.B. Post = Posttest; FEW: the Functioning Everyday with a Wheelchair tool (the self-report version); FEW-C: the Functioning Everyday with a Wheelchair tool - FEW-Capacity (the clinic-version); FEW-P: the Functioning Everyday with a Wheelchair tool - FEW-Performance (the home-version); (FEW: 0 = completely disagree; 3 = completely agree); (quality data: 0 = unacceptable (standards not met; 3 = acceptable (standards met). Figure 8: Exhaustive CHAID analysis of the FEW-P change score (Quality): Functional indicators and demographics associated with more and less favorable outcomes. N.B. Demographic (Yes: with arm support/removable; No: without arm support/removable); Pre = Pretest; FEW-P: the Functioning Everyday with a Wheelchair tool - FEW-Performance (the home-version); # PA = Number of physical assists. Table 1: Study participants’ demographics at baseline (n=19). Table 2: Type of wheelchair and seat functions at pretest and posttest (n=19). Table 3: Items of the FEW, FEW-C, and FEW-P.
Table 4: Summary independence scores of the FEW-C and FEW-P.
Table 5: Descriptives of change scores for the FEW, FEW-C, and FEW-P (N=19). Note: Change score = Posttest minus pretest. Table 6: Cross-validation results for the FEW model. Table 7: Cross-validation results for the FEW-C (independence) model. Table 8: Cross-validation results for the FEW-C (safety) model. Table 9: Cross-validation results for the FEW-C (quality) model. Note: FEW-C: The Functioning Everyday with a Wheelchair tool - FEW-Capacity (the clinic-version). Table 10: Cross-validation results for the FEW-P (independence) model. Table 11: Cross-validation results for the FEW-P (safety) model. Table 12: Cross-validation results for the FEW-P (quality) model. Table 13: Summary of exhaustive CHAID models. 6Within group with less favorable outcome based on removable arm support pretest. Table 14: Differences between pretest and posttest in average health and health today. Citation: Sarsak HI (2019) Factors Associated with Change in Functional Performance among Wheelchair Users. J Phys Med Rehabil Disabil 4: 028. Copyright: © 2019 Sarsak HI This is an open-access article distributed under the terms of the Creative Commons Attribution License, which permits unrestricted use, distribution, and reproduction in any medium, provided the original author and source are credited.